Since there are more and more material selection for the bathroom decoration, no matter the artificial one or natural, which are all quite popular. 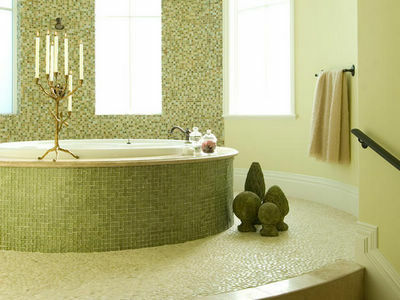 You can be as creative or traditional as you want when choosing your bathroom flooring. From ceramics to cement flooring and pebbles, the possibilities are endless. Today, we would like to introduce several floor ideas with you. Concrete flooring is the first one that we would like to introduce. An alternative to traditional bathroom flooring is concrete. These oversized concretes create a consistent feel throughout the room, while still offering the practicality that is expected from their ceramic counterparts. Pebble Stone Tile would be also an idea option, for that it provides a nature feeling. When traditional tile-work simply will not do, opting for pebble stone tile may make all the difference. In this simple and serene bathroom, the pebble floor is not the focal point but is rather the thread that sews the entire room together. Some people would like the bright feeling, then you may choose the marble effect. In many rooms, the tile-work may simply provide a necessary background, but in this bathroom the ceramic tiles add quite a bit to the mood. The stunning light gray tiles in this room reflect both the natural light pouring in from the window and the soft light of the chandelier.